Stamping with Shelle: Christmas in October!!! 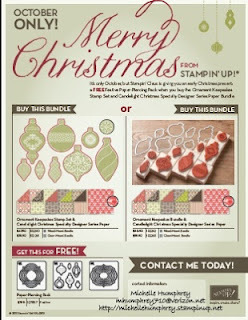 It may only October, but Stampin' Claus is coming to town! Get a FREE Festive Paper-Piercing Pack when you purchase the Ornament Keepsakes Set and Candlelight Christmas Specialty Designer Series Paper. Please contact me to place a customer order or click here. Single Stamp Offer - Limited Time!